Thanks to nuffnang again! muahahaha got the invitation to the premiere screening all the way in KLCC yo! Anyways, the movie was alright. I was expecting much more, like seriously. Since it was a movie by Jon Favreau and Steven Speilberg! The storyline was some typical story line, where the Aliens came to Earth for some sort of material(which is gold in this movie) and at the same time the Aliens are capturing the Humans(Cowboys) to understand the behaviour of human better. Typical? yes? or no? you be the judge! I would rate 4 of out 10! 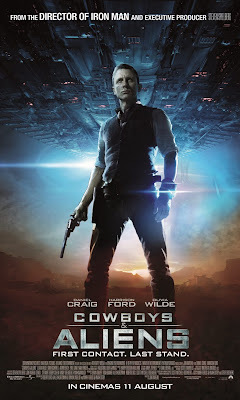 Anyways, it is a movie by blockbuster filmmaker Jon Favreau, directs Daniel Craig and Harrison Ford in an event film for summer 2011 that crosses the classic Western with the alien-invasion movie in a blazingly original way: Cowboys & Aliens. Joined by an arsenal of top moviemakers, the likes of Steven Spielberg, Ron Howard, Brian Grazer, Alex Kurtzman and Roberto Orci, which he brings an all-new action thriller that will take audiences into the Old West, where a lone cowboy leads an uprising against a terror from beyond our world. In 1873, New Mexico Territory, an unnamed loner (Daniel Craig) awakens in the desert injured, with no memory, and a strange metal band shackled to his wrist. He wanders into the small town of Absolution, where the local preacher, Meacham (Clancy Brown), treats his wound. After the stranger subdues Percy Dolarhyde (Paul Dano), who has been terrorising the populace, Sheriff Taggart (Keith Carradine) recognises him as Jake Lonergan, a wanted outlaw, and tries to arrest him. Jake nearly escapes, but a mysterious woman named Ella Swenson (Olivia Wilde) knocks him out. Percy's father, Colonel Woodrow Dolarhyde (Harrison Ford), a rich and influential cattleman, arrives with his men and demands that Percy be released to him. He also wants Jake, who stole Dolarhyde's gold. During the standoff, alien spaceships begin attacking the town, and Percy, the sheriff, and many townsfolk are abducted. Jake shoots down one ship with a device concealed in his wrist band, ending the attack. Dolarhyde, Ella, and some townsfolk form a posse to track an alien that may have ejected from the downed ship. Jake, meanwhile, travels to an abandoned cabin, and in a flashback, recalls returning there with the gold just before he and a woman, Alice, were abducted by the aliens. Jake returns to join the posse. During the night, the alien they were tracking appears and kills Meacham. By the next morning, most of the posse has deserted, and the others are attacked by Jake's former gang. Jake, who stole the gang's loot after their last heist, attempts to retake control, but fails. As he and the others flee, the aliens begin attacking again and Ella is seized. Jake jumps aboard the ship and attacks the alien pilot, causing the ship to crash, but Ella is mortally wounded. Chirichahua Apaches capture the posse, blaming them for the alien attacks. As Ella's body is dumped on a fire, she is fully resurrected. Ella is actually an alien warrior sent to Earth to help resist the invaders after they destroyed her homeworld. The aliens, who have been abducting humans to perform experiments on, are also mining gold to power their machines. They are not invulnerable, however: Jake's gauntlet weapon which can kill them, as well as stabbing and shooting, though the creatures are far stronger and more durable than humans and have superior weapons. Ella claims Jake holds the secret to the aliens' whereabouts and says they must stop them before they exterminate all life on the planet. After drinking the Indians' medicinal brew, Jake recalls that Alice died in an alien experiment, but he escaped, inadvertently stealing the alien weapon. He can also remember the aliens' hidden location. Armed with this knowledge, the group, now led by Colonel Dolarhyde, prepares to attack the aliens' grounded mothership. Jake returns to his old gang and persuades them to join the fight. In a sneak attack, the humans breach the spaceship, forcing the aliens into a ground battle. Jake and Ella board the ship and free the captives, but Jake is captured. Dolarhyde rescues him and both men escape the ship after killing the alien leader. As the remaining aliens are taking off in their damaged craft, Ella sacrifices herself, destroying the ship using Jake's gauntlet. Jake's memory partially returns, and some abducted townsfolk can recall their past, while others, including Percy Dolarhyde, cannot. Still a wanted man, Jake decides to leave; the sheriff and Dolarhyde say they will claim that he was killed. The citizens intend to rebuild the town with the expectation that the newly discovered gold mine will soon bring many new settlers. It is revealed that this is the secret origin of Tucson, Arizona. Check out the trailer as well! or maybe the website as well, click here! Do let me know what do you think after u watch it! I found it not bad but some scene just doesnt make sense ! It was so so to me. This is one of the best movie I have seen so far.Its an action pack movie.Its a gift for action lovers.Movie has some fantastic scenes which are unbelievable.I like the story of the movie which is key point for its success.